1 What Dies do I Need? 2 What Do the Dies Do? For a new reloader, choosing a set of dies can be very intimidating. The good news is, dies are some of the easiest reloading components to buy! There are a few minor differences between different brands of dies and a few things to look for, but for the most part, you shouldn’t have any trouble finding a good set of dies to fit your needs. As long you buy a set for the proper caliber, you will be good to start reloading! What Dies do I Need? What Do the Dies Do? The very first (and arguably the most important) die in a set is going to be the resizing/depriming die. This is the die that completes the very first step in the reloading process. This die (usually made of high-quality steel or carbide) is the exact shape of the specified caliber and will re-form the fired case back into the proper size. Most of these dies will also have a decapping pin, which pushes the old primer out while the case is being resized. While a case trimming die is not very common, it is something you can consider adding to your die set. As you continue to load cases over and over, the brass stretches and the case gets longer. Eventually, you will cut a little bit of brass at the end of the case in order to get the length back in spec. There are many different ways of doing this, but one of them involves a die that is inserted into your press and a cutter. The resized case is inserted into the die, and the cutter is rotated several turns. This cuts just a little bit of brass off of the end in order to get the length back into spec. If all you have is a single stage press, you won’t have to worry about purchasing one of these at all. In fact, most die sets do not even include one, and it is seen as an “add-on” item. On a progressive press, this is the die that sits in the tool head that funnels the powder into the resized and primed case. If you are manually charging your cases, then you will have no need to purchase one of these dies. Another very important step in the reloading process is the bullet seating. This is typically the second die in a 2 or 3 die set. This is a very simple die, and usually has a floating component in the center of the die that cradles and supports the neck of the cartridge and aligns it with the bullet before using the final portion of the stroke to press the bullet into the case. A factory crimp die is often the 3rd die in a 3 die set, but you can also purchase them separately to add to any 2 die set. This die usually consists of a slightly tapered form, and some of them get tighter when you insert a case into the die. The crimping is the last step in the reloading process and is much more common on pistol caliber rounds than rifle. Crimping is when the neck of the case is squeezed around the bullet, which prevents the bullet from getting pushed any further into the case. With most straight wall pistol caliber cartridges, you will have the choice between carbide and steel dies. When re-sizing your cases, you are required to use some kind of lubricant on the case, otherwise, there is a good chance that it will get stuck in the sizing die. There are many different case sizing lubricants out there, but they are almost all a pain to use and leave your case feeling oily and greasy. (This is why I often elect to tumble my cases after I resize them, as this gets all the excess lubricant off). If you get a good set of carbide dies, however, you are not required to lubricate the cases before sizing. These dies are quite a bit more expensive but are well worth the price. If you are looking to crank out 9mm rounds as fast as you can on a progressive press, then this 4 die carbide set may be just the ticket. 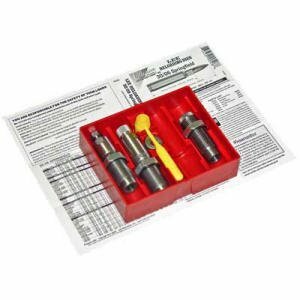 This Lee set includes a full-length carbide resizing die, a powder through expanding die, a bullet seating dies, and finally, a factory crimp die. The carbide resizing die eliminates the need for you to lubricate your cases, which will add a lot of speed to your reloading process. While you will probably not be able to achieve match grade accuracy and shoot sub-MOA groups with this die set, you will be able to effectively turn your progressive reloading press into a full-scale ammunition factory! While this set will also work great with a single stage press, it does include one die more than what you absolutely need. If you are planning on upgrading your press in the near future though, it would still be a smart investment to get this 4 die set. If you are a serious competition shooter who demands the absolute best out of their reloads, then this match grade die set from Hornady may be right up your alley. This Hornady is a fantastic die set from a fantastic company that should perform well above your expectations. The elliptical expander on the sizing die is polished to reduce neck stretch and friction, while the neck sizing bushings are interchangeable to ensure a lifetime of match grade accuracy. The seating die also includes a roll crimp feature to secure the bullets and eliminate the need for a separate crimping die. If you are looking for a good, affordable die set that will help increase your loading speed, then you may want to consider this 3 die set from Lee. This die set includes a carbide sizing die, powder through expanding die and bullet seating die. 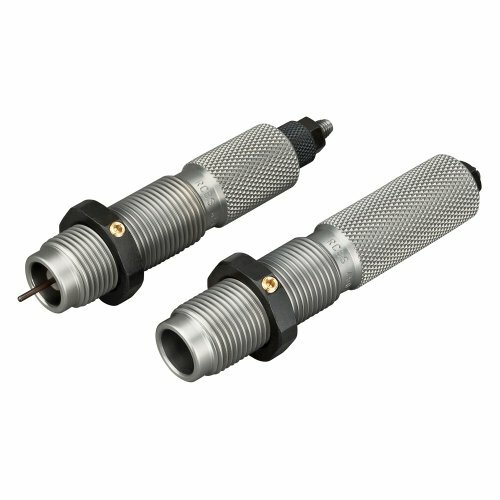 This set does not include a crimp die, so if you would like to crimp your loaded rounds you will need to purchase that separately. This is far from a match grade die set, but it will certainly get the job done at an affordable price. The carbide sizing die also does not require case lube, which will really help increase your round count. 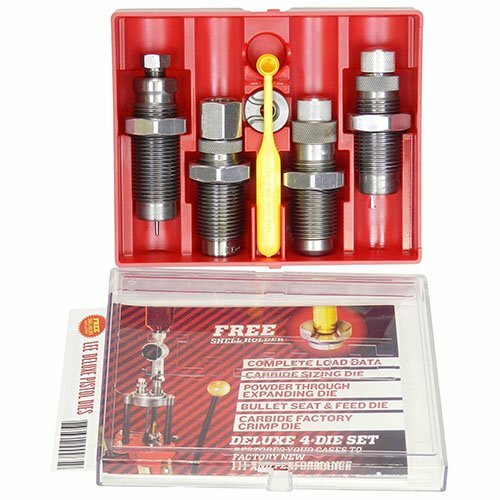 If you have a single stage press, you may want to look for a die set that does not include the powder through expanding die in order to save a few more bucks, but if you plan on purchasing a progressive or turret press anytime in the future, then it would be smart to go ahead and get this set. 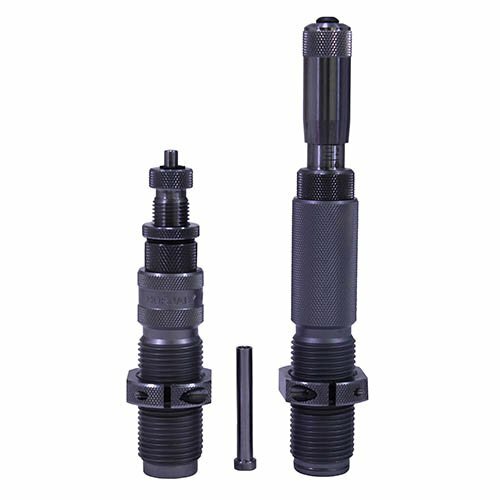 If you are looking to reload .300blk (let’s face it: if you shoot .300blk, you need to be handloading for it) then it would be hard to go wrong by picking up this die set. 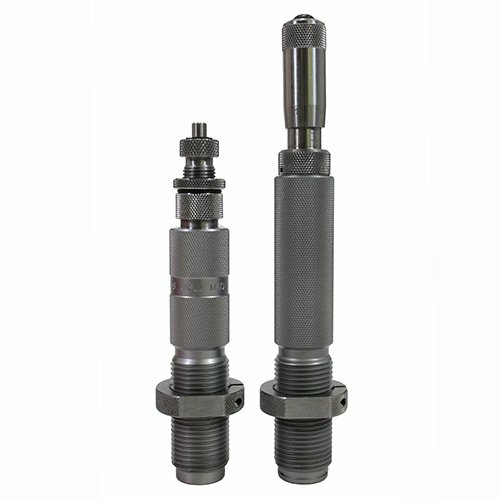 RCBS produces high-quality reloading components, and this die set is no exception. The dies are internally vented to avoid damaging the case during resizing, and the high-quality steel dies are hand polished to exact specifications. The tops of the dies are also knurled in order to facilitate easy changes. One tradeoff is that this is a fairly expensive die set. Obviously, that is offset by the high quality of these dies. If you are doing a large volume of reloading or planning on doing heavy-duty tasks such as reforming old .223 cases, then it is well worth it to spend the extra money on a quality set of dies. If you are looking for a die set for .338 Lapua Magnum, why would you consider anything less than the best? I know that, with all of the money I have wrapped up in my .338 Lapua rig, the last thing I am going to do is save a few bucks by cheaping out on non-match grade dies. No, only the most premium hand-loaded match grade ammunition gets fed into my long range rifle, and I am able to do that with this match grade die set. While this die set is quite expensive, the overall quality is well worth it. When even the cheapest factory ammo costs upwards of $4/round off the shelf, it won’t take long for you to not only make your money back but have the most accurate rifle on the range. If you demand the most out of your rifle and want to be able to feed it the best ammo possible, then this die set from Hornady is a very worthwhile investment. Let’s face it: after you’ve spent all of this money on your press setup and components, the last thing you are going to want to cheap out on is the die set. While each caliber and cartridge type is going to have its own features that you will want, each of the die sets above is going to be more than adequate to suit your needs. Whether that be reloading speed or match grade accuracy, there is a die set out there that will do exactly what you want, and any of the sets listed above are great places to start. So now that you have all the information that you need, you can go out and purchase your own perfect die set today!